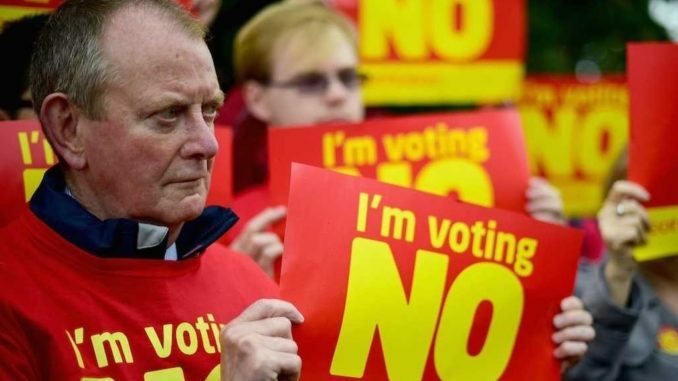 The ‘No’ campaign have said they are confident of achieving victory in Roscommon/South Leitrim in today’s referendum. The constituency achieved some notoriety after the 2015 marriage equality campaign when it was the only one in the country to vote No. It was decided at the time that maybe the local people there weren’t quite ready for equal rights and that they should go back and revisit the divorce referendum first before catching up with the rest of Ireland. However an opinion poll in today’s Connaught Times suggests that the people of Roscommon/South Leitrim will actually vote overwhelmingly against divorce. Jim Cullen is chairman of ‘Roscommon Says No To Everything’ and he told us that he just doesn’t like change. Meanwhile in the rest of the country experts predict the 8th Amendment will be repealed as voting gets under way in today’s other referendum. The No campaign finds itself behind in the polls despite having the support of such highly respected role models as the Catholic Church, Jim Corr and the Mother out of Crystal Swing. Head of the No campaign Ronan Mullen said that whatever the result, he will accept the will of the Irish people.